Sean Spicer’s appearance at the Emmys last night has turned out to be a polarizing one, unsurprisingly enough. After all, even though he’s been booted from the White House, that doesn’t erase Spicer’s history of attacking the press, gaslighting the American public, and, oh yeah, defending Hitler in his short-lived capacity as press secretary. But he was still invited on by Emmys host Stephen Colbert for a bit on misrepresenting the audience size, which again, is something he actually did as a government official. The disgraced former Easter Bunny said it was “an honor” to be among the same Hollywood elite liberals he complained picked on him in his first post-resignation interview with Sean Hannity. He told THR he has “a lot of respect for folks who do what they do in film and on television, so it’s a real honor to be invited,” you know, even if several of those people had a hand in mocking him before a national audience. Spicer’s already landed a gig as a visiting fellow at Harvard’s Kennedy School Institute of Politics this fall, so he isn’t exactly lacking for opportunities in the wake of his firing. 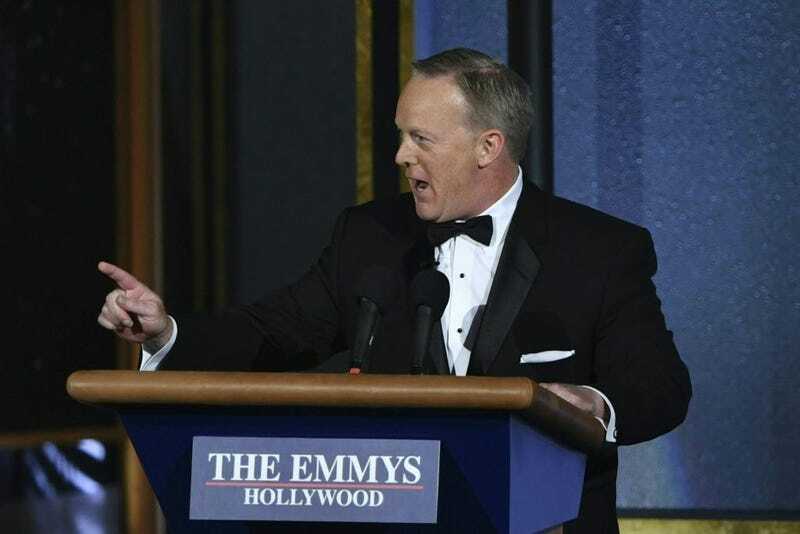 Now The Huffington Post reports plenty of viewers, including journalists and celebrities, thought the Emmys ostensibly lending Spicey a hand in turning things around was questionable, to say the least. Keith Olbermann and Bess Kalb, a former Emmys writer, also weighed in on the normalization of Spicer, and the inclusion of Roger Ailes in the In Memoriam reel that left out comedian and Chappelle’s Show cast member Charlie Murphy. As Spicer recently demonstrated on Jimmy Kimmel Live!, he doesn’t think he or Donald Trump have done anything to be sorry about; it’s just the “mainstream media” that have demonized them. In his own appearance on Kimmel’s show last week, Colbert was outwardly skeptical of Spicer, saying that he couldn’t set off on the road to redemption until he appeared to regret what he did in the first place. UPDATE: Spicer has since clarified in an interview with Deadline that he was approached about the Emmys bit by Colbert and his executive producer on Thursday, the day after Colbert made his comments on Jimmy Kimmel Live!. “I thought it was interesting, and we went from there,” Spicer said.